← Should I Spend Donuts on Radiant BS Station? You’ll be able to place the Hypertrain, and IF you have Otto (remember he’s a premium character) you’ll automatically unlock Conductor Otto. If You don’t have Otto Conductor Otto will go to your storage until you purchase Otto.. Conductor Otto: Ah, man. I’m so bummed! Bart: Hmm, you’re wearing a suit, and you look sad. Are you an undertaker? Conductor Otto: No, I was the conductor for the dopest train in the world – the Arctic Hypertrain. But I got fired because I forgot to pick up some kid who was supposed to have a magical holiday trip. At the time, I was having a magical holiday trip of my own. Lisa: Otto, is there anything you can do to get your conductor job back? Conductor Otto: I have to prove I can teach a little kid to believe in Christmas again. Lisa: We can help! Bart’s totally cynical, but I bet we can convince him that Christmas is real. 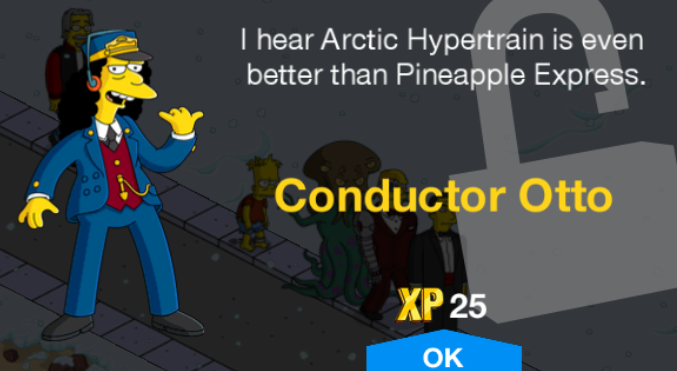 Lisa: O.K., Conductor Otto. You have to prove you can help a kid regain his faith in Christmas. How do you start? Conductor Otto: Uh, by understanding the problem. Bart, little dude, why don’t you believe in Santa? Bart: Because I’m ten years old, and I’m not an idiot. I only know one fat man who delivers presents and eats cookies. He also once got his head stuck up a chimney. Lisa: It’s true. Dad heard a squirrel in the chimney and thought it was planning to steal his nuts. Conductor Otto: Okay. To convince a kid that Christmas is real, we just have to get him on the Arctic Hypertrain. Lisa: I just wish the train wasn’t coal-powered. I would think people at the North Pole would be more concerned about global warming. Conductor Otto: Oh, I can turn the train green. We just use a certain kind of green fuel. But don’t breathe the fumes, little dudes. Leave that to me. Bart: “To Whom It May Concern, care of North Pole”. “I hereby affirm that Conductor Otto and the Arctic Hypertrain have restored my faith in Christmas. I will always believe until I am old and gray”. “However, if the bullies make fun of me, I will deny everything and act all cool and grown up”. Conductor Otto: Thanks, little dudes. That letter is sure to get me my job back. Lisa: If you want to get high in your career, just come to us. Conductor Otto: Actually, I prefer to use some guys I know downtown. What Does It Do? : Animated when in use, smoke and rainbows come from the engine. 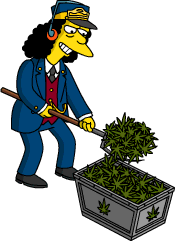 Also, Otto will have tasks there. And that’s it…the details on the 2nd Act 2 prize! Technically a free land token is next awarded at 7,500 but since that’s not a tangible prize for Springfield, just a free land token. The next prize we’ll cover is..
Kwanzaa Dr. Hibbert- Awarded at 9,400 . This will be the next prize we break down in the prize guidepost. What are your thoughts on Conductor Otto? Have you unlocked him yet? Able to use him? Thoughts on his tasks or questline? How about the Hypertrain? Sound off in the comments below, you know we love hearing from you! 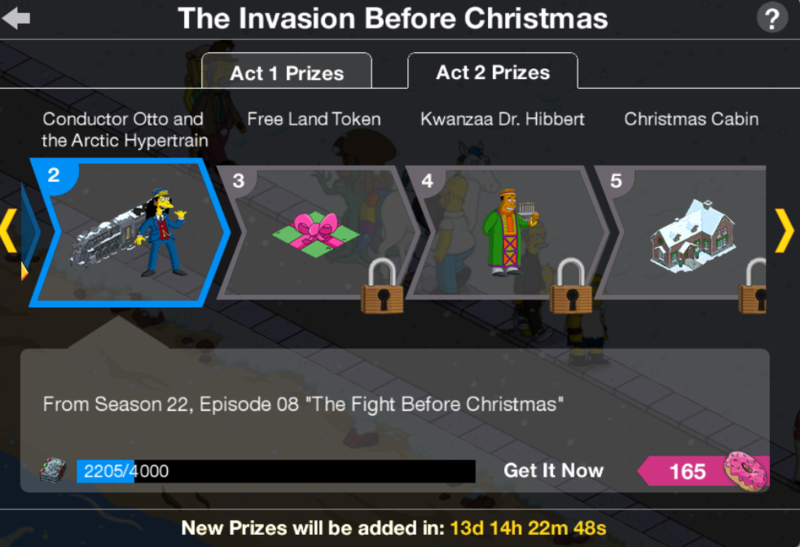 This entry was posted in Decorations, Tips and Tricks, Updates and tagged Act 2 Prizes, Arctic Hypertrain, Conductor Otto, Conductor Otto Questline, Conductor Otto Tasks, how do I get Polar Express Otto, Polar Express Simpsons, Rigellian Christmas, Sacred Tome Prizes, Tapped Out Christmas Event, Tapped Out Kang and Kodos Christmas, Tapped Out Tips and Tricks, The Simpsons Tapped Out, TSTO Addicts, TSTO Alien Invasion Event, TSTO Christmas 2017, TSTO Tips and Tricks, TSTO Winter Event 2017. Bookmark the permalink. I never purchased Otto and now I can’t. Is he unavailable until after this event ends. I want to be able to use the train – it’s a beauty. If you read this and know of a way I can get the bus/Otto I’d really appreciate a response. Thanks! I wish we could have the train on a track instead of sitting on the ground. I guess it could be difficult to do since we have the Monorail track going around our towns. You CAN put the ice roads under it…. Does that help? When are they going to release land for us to spend our land tokens on. I need more room to expand my Christmas section. Merry Christmas and Happy New Year. Thank you for all you do to keep us informed. No, although you should have completed a good portion of the prize track at that point. I honestly don’t know why EA bothers with the bonut rounds anymore when they make them so hard to get any. Is there even a bonus round for this act? If there is, when does it start? Never mind. It took awhile for the next part of the quest line to trigger. Nope, these are all the same ways to get the 3 currencies in Act 1 and pre- and finished Boss Battles in Act 2. If you seen the calendar on this blog then you should be on 12,411 Sacred Tomes (Act 2 prize currency) and have the Christmas Cabin by the end of today, if you already have more prize currency then you should not worry about the currency slowing down. You haven’t somehow got it stored in your inventory ? Sadly not in inventory, town or store. I may un-install and re-install, though not too hopeful. 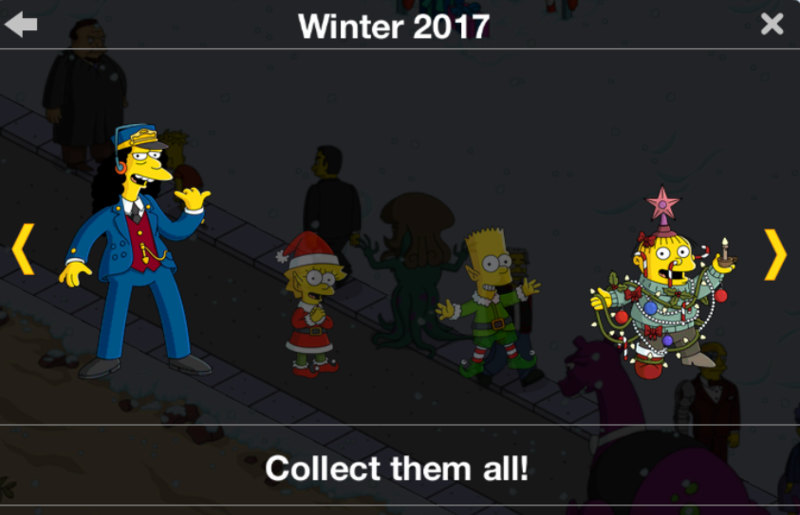 If you’ve searched your entire character inventory and no Otto/Bus (they should be a set – in the section with Homer and Bart’s picture – at the top), then I would try removing and re-loading the game. Just make sure you log in after you re-load.